ANSWER this honestly: When you find yourself seated in the emergency row of an aircraft – and you have to be able-bodied, over 14 and willing to assist in an evacuation to be allowed to sit there – do you fantasise about what would happen if the plane were to crash-land? Actually why stop there? The plane has been hijacked! 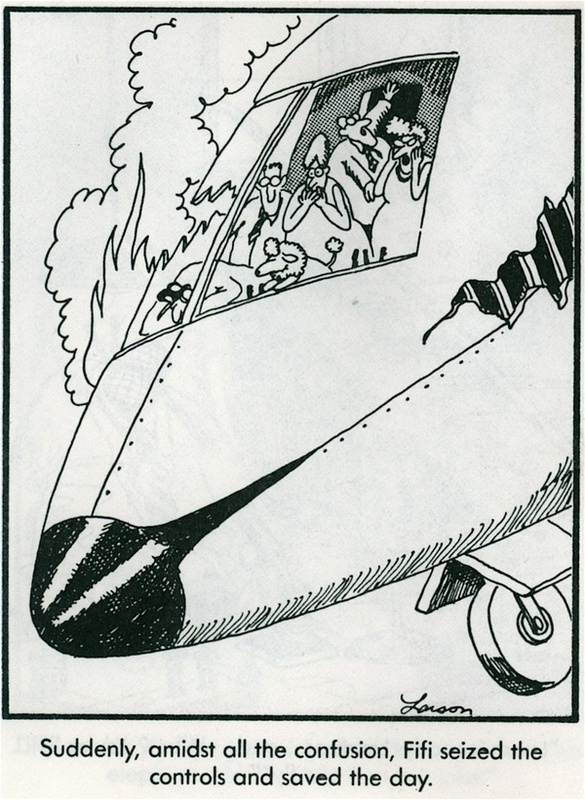 Drawing on your two weeks of karate training, you must disarm the hijackers with one deft move!… The pilots have collapsed/ lost their wits/ turned rogue! You will have to seize the controls and land the plane yourself! That is more or less what happened this week, when a passenger on a Lufthansa flight from Newark to Frankfurt had to help land a Boeing 747 at Dublin airport because one of the pilots had become incapacitated. Hero! Well, more or less… On closer scrutiny the story lost some of its lustre (as all stories tend to do, dammit). What happened was the co-pilot developed a migraine, so the crew issued a mayday call. I’m not an aviation expert (no, no, I’m not, I don’t care what anyone says) but does that strike anyone else as playing fast and loose with the term mayday, a little bit? ‘Mayday, mayday, the co-pilot has a boo-boo’? Also, the passenger who stepped in to help was an off-duty pilot and so – unfortunately for the sake of the dramatic tension of the piece – probably knew how to land a plane without the aid of a pep talk from a character played by Leslie Nielsen. Perhaps mistakenly, you tend to imagine that pilots don’t indulge in air crash heroism fantasies. Bit of a busman’s holiday, really. But if they did, they would almost certainly not fantasise about landing a plane uneventfully in Dublin after having to take over Mr Diddums’ duties as co-pilot. No, they would more likely fantasise about ditching a stricken Airbus in the Hudson River, saving all 155 souls, as Captain Chesley Sullenberger III did in 2009, when a flock of Canada geese struck his plane. The geese do add something regrettably comical to Sullenberger’s story, but otherwise it’s a perfect heroism fantasy for a pilot – the sort of thing that would make other pilots jealous, and would lead to a two-book publishing deal and a lucrative career on the speaking circuit. Doctors might engage in the odd air-crash heroism fantasy too, but it’s unlikely that a doctor daydreams about vaulting over restaurant tables to administer the Heimlich manoeuvre to another diner. Likewise, firefighters probably don’t fantasise about rescuing puppies from burning buildings. It’s just what these people do. So the world of vivid heroic fantasy is left to those of us who don’t have heroic careers, such as mime artists, panel beaters, certain kinds of journalists (‘Emergency? Say no more. I’ll throw together a whimsical comment piece in a jiffy’), and forklift drivers. And yet a forklift driver can become a hero too, if he’s a ham radio enthusiast. Benny Young from Co Tyrone intercepted a mayday call from a United Airlines Dublin-Boston flight last month when the pilot could not contact air traffic control because of Hurricane Sandy. (Now that’s what I call a proper mayday.) Benny was able to relay the pilot’s communications and the plane was safely diverted. Not knowing much about what it means to be a ham radio enthusiast, you do tend to assume that it consists of a lot of sitting around in converted sheds, murmuring “niner, niner” into the indifferent silence. This might be unjust, but nevertheless ham radio enthusiasts are among the very last people you would think would ever get to see a heroic fantasy come true. It seems ham radio enthusiasts themselves think much the same thing. Terry Whyte, secretary of Strabane Amateur Radio Society, of which Benny is a member, remarked: “This kind of thing is an amateur radio man’s dream”, and added – tellingly – “everyone else is jealous”. It goes to show, you never know when you might be called on to be a hero. Keep in practice by rescuing stranded spiders, and three-legged kittens, and doomed, flightless birds, and you never know, you might be lucky enough to be in a plane crash some day.